One of the vehicle success stories of the early years of this new century has been Unvi’s Touring midicoach. It is difficult to pin-point why it has been so successful. At a time when the market was moving almost universally to rear engines and automatic transmissions, the Touring was the reverse; it was built on a truck chassis, the Mercedes-Benz Atego, it was forward engined and it had manual transmission, although there was an automated transmission option for those that needed it. Others had tried a similar formula before, notably Optare with the Ferqui built Solera, but that never achieved the popularity that the Touring did. Early Tourings, like Soleras, had the entrance aft of the front axle but the model really took off after Unvi introduced a version with an entrance ahead of the front axle. This allowed extra seating capacity. It wasn’t the most user friendly entrance ever seen because of the need to get around the bulk of the forward engine but it was acceptable to many. It must have been, Unvi has built approaching 200 for the UK and Ireland. What the Touring did have, and I believe this is something which accounts in some measure for its success, is style. It is a great looking vehicle and it has a wow factor. Even now, 12 years after Esker introduced it at the Dublin Show in 2002, the Mark 1 Touring still has a presence when you see it on the road. What it also turned out to have was flexibility and reliability. 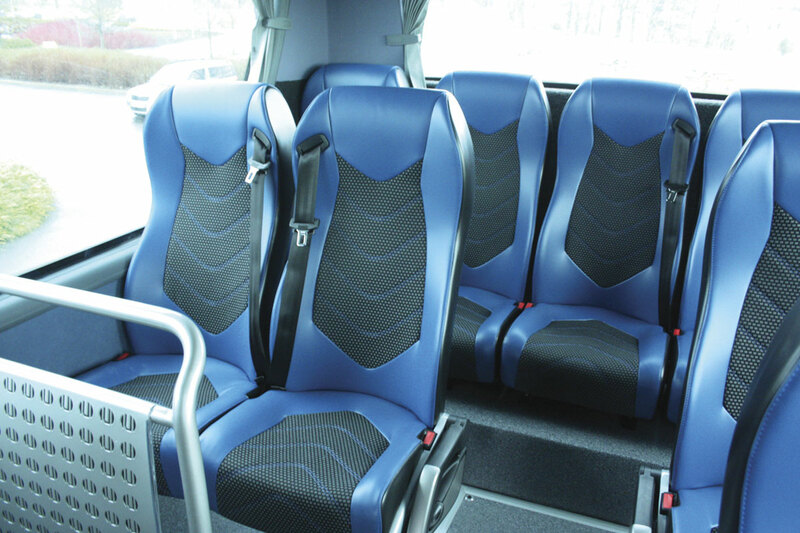 Operators found that with its compact size (10.0m), its good seating ratio (up to 41) and its massive luggage capacity (7.4 cu.m), it could be used for a wide variety of different duties. It was equally at home doing a school run, a day trip or a tour. 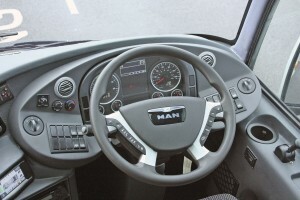 I have visited many operators who have Tourings and almost universally they tell me that it is the busiest vehicle in the fleet, which accounts for why so many retain them longer than normal and why they are still relatively rare in the secondhand columns, rarely stay there for long and still command a good price. Three years ago Unvi began designing the replacement for the Mark 1 Touring and I have monitored the project throughout its development. From the outset Unvi sought to retain all the good established characteristics of the original Touring but also extend its market appeal. To do that Unvi knew it had to develop two versions of the Touring. As well as a replacement for the established forward engined version it needed a rear engined version which would appeal to those operators who would not accept the use of a forward engined truck chassis with a compromised entrance and who wanted automatic transmission. The first of the new Tourings to appear was the forward engine version, the Touring GT, which I evaluated over a year ago, driving the first one back from Unvi’s factory in Spain. 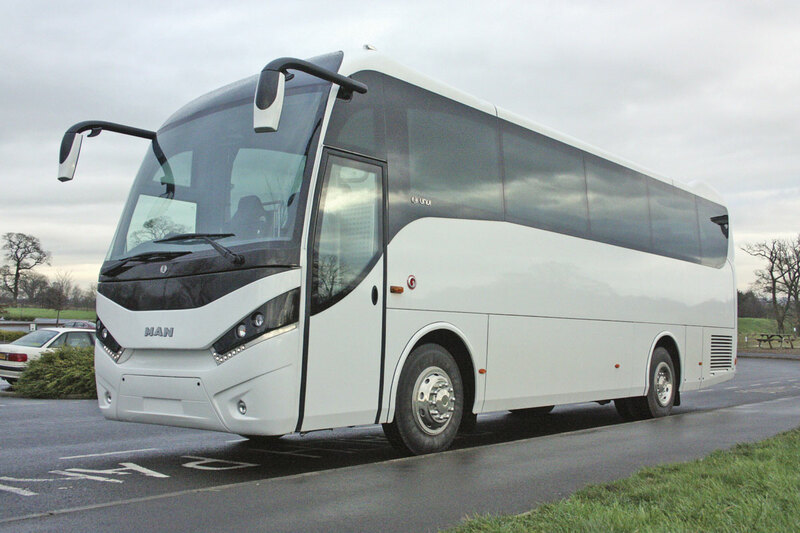 At last year’s Coach and Bus Live Unvi launched the second new Touring, the rear engine Touring GTR, and I have now evaluated that too. When I first saw the prototypes for both the Touring GT and the GTR I was struck by how close they were to the original design studies that I had seen at Unvi a long time ago. Standing side by side, as they were on Unvi’s stand at Coach and Bus Live, it was impossible to tell that they were so different under the skin. That was deliberate. Unvi has successfully achieved the design goal of as much commonality as possible. 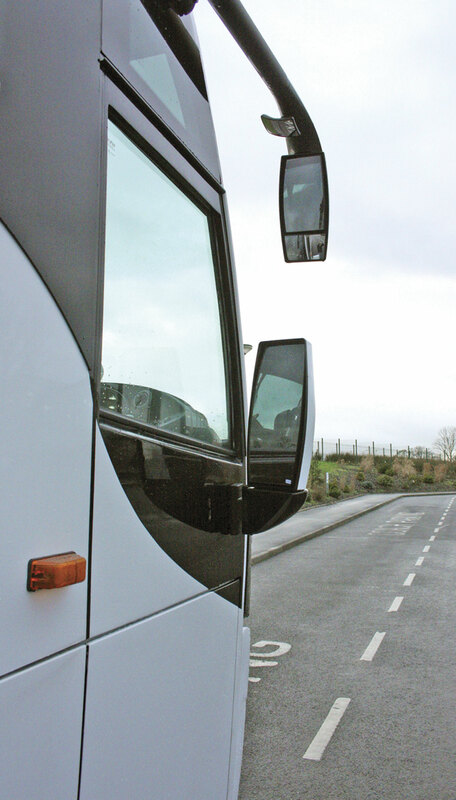 The coaches are 80% the same, particularly in key areas like glazing, panelling and fittings. However, despite their outward similarity, they are very different vehicles. The Touring GTR is 10.26m long, 2.5m wide and 3.58m high with a wheelbase of 5.1m. 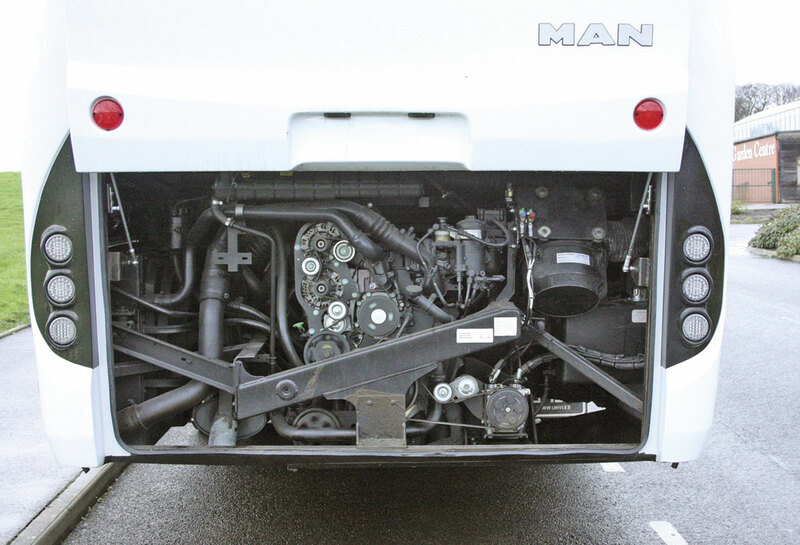 It is designed around units from the MAN 14-280 chassis whereas the forward engined GT is built around the Mercedes-Benz Atego. The GTR has the MAN D0836 6.84 litre, six-cylinder diesel engine mounted at the rear. In Euro5 form this uses only EGR to achieve emission control. The vehicle I was evaluating was fitted with the Euro5 engine (LOH64) but this will give way to the Euro6 (LOH 72) version as it becomes available. The Euro6 version uses EGR and SCR with AdBlue to achieve emissions control. Both versions produce 290bhp (213kW) at 2,300 rpm and have maximum torque of 1,100Nm at between 1,250 and 1,750rpm. The engine is matched with the excellent six-speed ZF EcoLife AP1200 fully automatic transmission with integral retarder. Unvi’s reputation in the UK and Ireland may be for forward engined coaches, but it has been building full size rear engined vehicles for many years and is also one of the world’s leading producers of double deck sightseeing buses. It has excellent rear engine credentials. The front axle is a beam unit with two air bags which can be raised and lowered and incorporates integrated power steering. It is rated at 5000kg. The rear axle is a hypoid bevel unit with a capacity of 5440kg. It is mounted on a conventional four air bag layout which again has raise and lower facilities. The rear axle ratio is 1:4.56. Braking uses discs all round and incorporates ABS, TCS, EBS and ESP. The vehicle I was evaluating was the first to be fitted with 22.5in diameter by 7.5in rims. The Touring GT is only available with 19.5 in rims in order to achieve the required entry layout. The Touring GTR is available with both 22.5in and 19.5in diameter rims to suit operator preference. It was shod with 265/70R tyres. Electrics are 24 volt and the unit has two 28.5 volt/120 Amp alternators. A 300 litre fuel tank is fitted mounted across the front axle with fuel filler on the offside. The body is constructed using Unvi’s jig built, welded system with extensively corrosion proofed high quality square steel tubing. The structure achieves all the required EU safety standards including R66. Side panelling is also in corrosion protected steel, bonded to the structure and incorporating extensive insulation. The front, rear and roof are GRP mouldings. Glazing uses large panoramic, bonded, tinted, double glazed units which are common to both the GT and the GTR. The same can be said of the large bonded, laminated, tinted windscreen which incorporates a darker tint, top sun band. A key feature of the new Touring is the way the windscreen line is carried into the roof line by the use of a matching glazed unit which appears to be part of the screen. This gives the vehicle not only a distinctive appearance; it also allows a lot of light into the front end of the coach. Both the powered driver’s side window and the courier’s window are heated. The entrance is ahead of the front axle and is fitted with a fully glazed, outward opening, plug door. This reveals a three step entrance and then there is a further step up into the saloon. A continental exit is mounted at the offside rear. Seating is mounted on plinths and the one I evaluated was fitted with 43 Grand Prix recliners trimmed in two tone simulated leather and incorporating retractable three point belts and gangway armrests. The GTR can have up to 45 seats. There is also a courier seat at the entrance. The centre gangway is carpeted, as is the entrance. Interior trimming uses soft touch suede materials for the roof and lower side panels. Window surrounds use plastic mouldings. Windows, including the rear window, are fitted with full draw curtains. 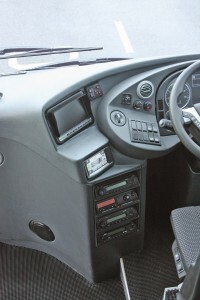 Full length parcel racks are fitted down both sides and these incorporate the usual individual passenger features of air flow control, reading light and hostess call. The racks are finished in soft suede materials with aluminium trims. Strip lighting is used throughout the saloon with a night driving facility. Halogen lighting is used for the entrance steps with LED lighting for the entrance itself. 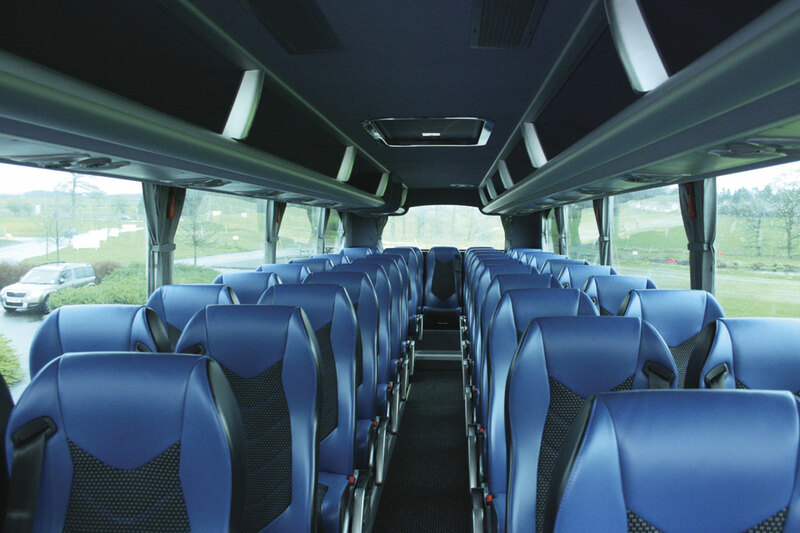 The coach is fitted with Hispacold air conditioning and convection radiators down each side of the saloon. Additionally, there is an extractor fan, a glazed roof hatch and the driver’s area has its own heating system. A useful fridge is incorporated into the dash. The coach is fitted with a Blaupunkt 24 volt audio system with AM/FM radio and CD player. There is a PA system with driver and courier microphones and rack mounted speakers throughout the saloon. There is also a DVD unit with front mounted 19inch fold flat monitor. A dash mounted fridge unit is mounted adjacent to the entrance. 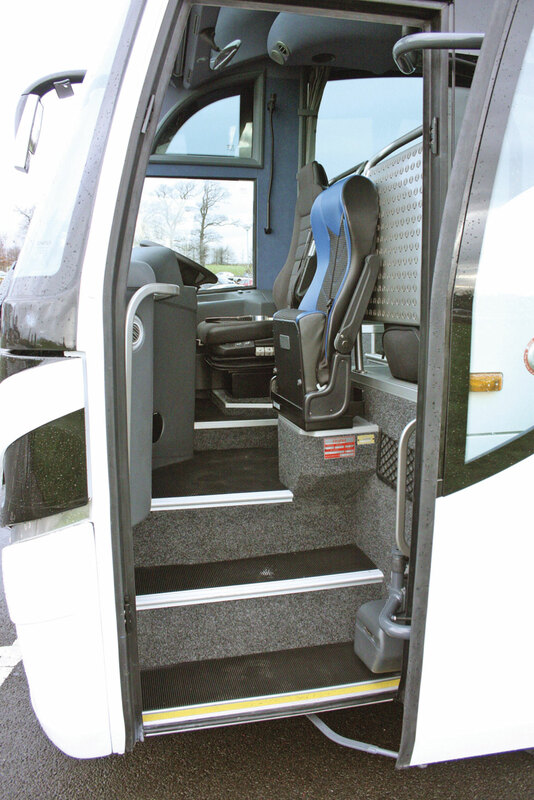 The whole of the area between the axles is available for luggage and is accessed by powered, parallel action doors. 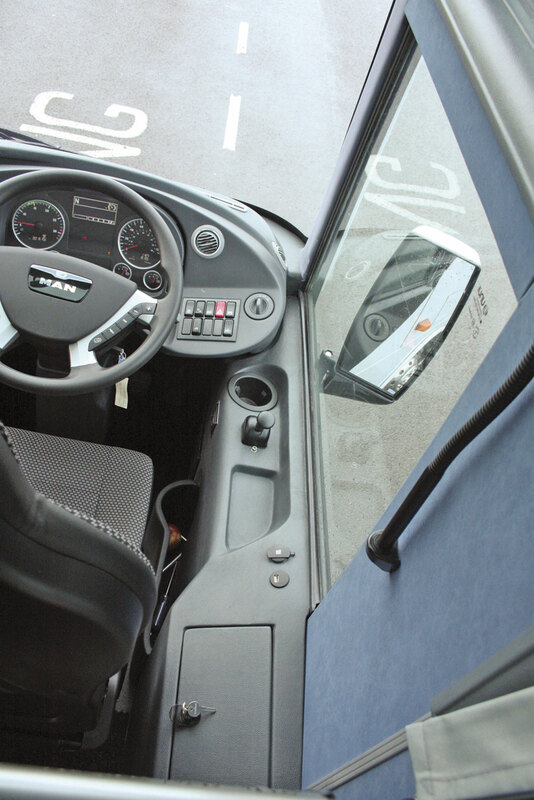 The capacity is 6.9 cu m.
In the driver’s cab there are: an adjustable steering column; a fully adjustable air suspended three point belted seat; powered individual sun blinds; and a lockable locker for driver and courier equipment. The courier area also benefits from an individual reading light. The main mirrors are mounted on preying mantis type arms and have dual lenses, heated and adjustable from the cab. Additionally there is a lower body side mounted offside mirror, which is also heated. The dash benefits from an enhancement package and incorporates a touch screen for many of the vehicle’s main functions, a separate reversing camera screen and heating/air conditioning control panel. Other details are fog lights, reverse lights with acoustic warning, reversing camera, LED daytime driving lights and wheel trims. There are a number of options available including a rear saloon or sunken toilet. The sunken toilet reduces seating to 37 and also impacts on luggage capacity. Other options include at-seat tables, Webasto pre-heater, additional monitors and for the driver Xenon headlamps with a wiper system. First impressions are all important and the Touring GTR doesn’t disappoint in this respect. Often small coaches, particularly where they are derivatives of larger designs, can look unbalanced, that is not the case with the either the Touring GT or the GTR. They are well balanced designs that retain that wow factor. The lines are clean and simple and the quality of the panelling and the GRP are quite exceptional. Unvi has earned a reputation over the years for the quality of its GRP and paint finishing and the new Tourings maintain that tradition. The entrance is well planned with deep, flat steps and well positioned grab rails. 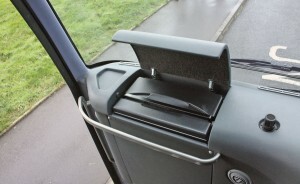 I was asked by Unvi to ignore the courier seat because, being a prototype, the coach did not have the final version. That will be a much slimmer unit. Immediately you reach the saloon level you are struck by the airy ambience created by the way the front end is glazed with the carryover of the curved glass above the windscreen. There is an additional step up into the saloon and then a flat floor through to the rear seats which are on a raised plinth. The standard of internal trim was very high. Unvi do take a great deal of care over trimming. No nasty edges or joins were evident, everything was finished off perfectly. A quick test of the seats showed these to be very comfortable but with a good level of support. In 43-seat configuration there was plenty of room between the seats. The cab is well treated. There’s nothing flashy, just a look of quiet efficiency. Outside I checked that access to things like the washer bottle and wiper mechanisms was satisfactory through a lift up panel at the front. Access to the engine for the daily checks is via a lift up panel on gas struts and gives good access. I was also impressed by the powered luggage doors which lift smoothly and give excellent access to the luggage area. All in all it looked a very well designed package. I had arranged to meet my hosts at Houghton Hall Garden Centre which is just off Junction 44 of the M6. It is a very popular spot for coach operators to use because it has excellent facilities: free parking, toilets and a café/restaurant! The Touring GTR had been brought down from Scotland by Gordon Robertson and Brian Ferguson from Unvi dealers Coachtraders and Unvi UK’s Manager, David McKinless, had driven up from Preston to join us. Climbing into the driving seat I easily achieved the necessary adjustments to the steering column and seat to accommodate my short legs and attain my preferred driving position. The mirrors were easily adjusted. I noticed straight away that the automatic transmission control was the simple turn switch with D,N,R; I prefer versions with the option of holding gears, and I did wonder whether this would prove to be a problem later in the journey. I had previously experienced the new touch screen system Unvi are using for the control of many functions, including the door, sunblinds, and luggage doors, but that was a year ago so I accepted a quick refresher from Gordon Robertson. It is a system that you quickly become familiar with. I started the MAN engine and there was that familiar and reassuring rumble although I have to say it was quite difficult to hear in the cab thanks to Unvi’s work on noise insulation. Power was instant, with no dwell between calling for it and getting a response. I selected drive, released the park brake and gently eased the coach out of Houghton Hall onto the A689 and cruised up to Junction 44 of the M6. Even in that short distance I was impressed with the good all round vision provided by the big screen, the well positioned mirrors and the changing of the automatic box. Heading south on the M6 I allowed the speed to build up, which it did, with very nicely placed ratio changes and no dwell. Quickly we were up to cruising speed against the limiter and I engaged the cruise control. The engine was operating well within its limits with revs generally around the 1500 to 1750 rpm mark comfortably in the maximum torque range. The coach rode beautifully, was nicely balanced and there was a feeling of security at the front end with no hint of floatiness or wander. I was impressed within a few miles with just how secure it felt on the road. There was no need to constantly correct the powered steering, it stayed precisely on line. There was little or no wind noise despite it being a quite windy day, and conversation with my companions was easy. The inevitable drizzle gave an opportunity to use the wipers and they swept a wide arc leaving the bulk of the screen clear. The preying mantis type mirrors gave a very good rear image and were steady. I also appreciated the dual lens system which allows blind areas at the front to be observed. I was less happy with the fixed driver mirror. This gave good vision but it was spoilt by the mirror’s habit of vibrating. Hopefully Unvi will sort that, because it is annoying. Typical of the weather we have been experiencing in Cumbria this year, one minute it was raining, and the next the low winter sunshine was dazzling me, despite the tinting of the screen. This gave the opportunity to use the electrically powered blinds accessed via the touch screen. A set of roadworks gave a first occasion to use the retarder, which I chose to operate off the steering column lever rather than via the brake pedal. I prefer to use hand levers, I’m old school. The retarder performed perfectly with an instant reaction and a steady progression through the five stages. After cruising down the M6 we left at Junction 40 and headed east on the A686. 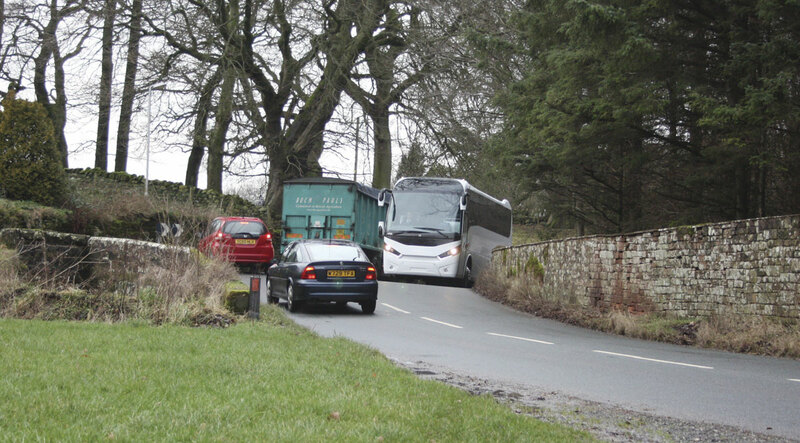 Although an A road it is typical of Cumbria in being relatively narrow with plenty of blind corners, humps and bumps and pinch points not designed for two 2.5m wide vehicles or, even worse, a coach and a tractor to pass. Again I was impressed with the way the coach rode. It was very secure and there was no roll, sway or shimmer. I chose to drive without using the retarder to get a feel for the service brakes. They were smooth, powerful and true; just what you want. After negotiating the tricky temporary bridge in Langwathby, (it’s been there 46 years so far) we continued on to Melmerby at the foot of the Pennines, 300ft above sea level. From here the A686 climbs to just shy of 2,000ft in the space of three miles. It achieves this on a perpetually rising gradient, quite steep in parts, and especially on the first two miles is just a series of very sharp, blind, switchback bends. This was why I had been concerned about the automatic transmission having a three position switch because in the past I have found it an advantage to hold the transmission in the lower gear and prevent the transmission from shuttling, trying to find the perfect ratio. Would the Touring GTR behave? In the same way that automatic boxes have improved over the years, so have the control systems, and the Touring GTR behaved perfectly. There was never a hint of the box trying to shuttle, it just kept in the perfect gear for the conditions. I had plenty of exercise going from lock to lock negotiating the very tight bends. After two miles, you are above the tree line and the road changes. It is still rising but the bends are less sharp and you have the advantage of being able to see other vehicles approaching. However the A686 still has a little surprise for you because the very last bend before the summit is wicked. It is one of the steepest points and the corner is more like a V than a U. The Touring GTR took it all in its stride. Even on the steepest section the revs remained in the middle of the band. The top of the climb is marked by the Hartside Café, from where the descent towards Alston is much less severe than the climb from Melmerby, but it is still a tricky road. It is continually dropping and it too has some demanding blind bends to negotiate. There was plenty of opportunity to use the retarder and again it didn’t let me down. Near Alston we turned on to the narrow A689 with its sharp blind bends, steep drops and lots of pinch points to create work for the driver. Throughout it the coach behaved perfectly. It sat on the road securely, it didn’t roll or sway and the positive braking, especially with the retarder, gave a feeling of security. At Brampton we joined the A69 heading for Carlisle and reluctantly I gave up the driving seat to Brian Ferguson so I could experience riding as a passenger. I quickly found that it was very comfortable. The seats were comfortable but nicely supportive, vision though the massive side windows was excellent and I particularly liked the glazed front dome. The combination of the convection heating and the Hispacold air conditioning produced a very comfortable atmosphere within the saloon. I appreciated the attention Unvi had made to sound insulation of the driveline because even at full speed on the Brampton by-pass, sat on one of the back row seats, it was very quiet and conversation was easy. It was also smooth and there wasn’t any sway or pitch. My experience of Unvi’s build techniques told me not to expect any rattles, vibrations or plastic on plastic squeaks and there weren’t any. So what didn’t I like about the Touring GTR? Little. I didn’t like the vibrating mirror, but I am sure that is easily sorted. The one thing I really didn’t like was the way that Unvi had positioned the all important touchscreen. In my view it is too low. You inevitably have to take your eyes from the road to use it but, because it is set low down, this takes too long. I know one quickly gets familiar with such things, but I still think it needs attention. I would like to see the touch screen raised to where the reversing camera screen is positioned and I would like to see that screen done away with completely and the reversing image relayed to the touchscreen. That would also allow the heating/air-conditioning control panel to be raised. Over coffee I talked to David McKinless about back-up for the vehicle, particularly with it having an MAN engine and ZF transmission, neither of which have been on Unvi UK’s radar before. David said that MAN, particularly the UK end, had embraced the project fully and had already put in place systems to support the product. All the dealers had already been briefed on how the product is to be dealt with. Overall the product is supported by Unvi’s own system which utilises Coachtec in Preston, Ferguson Fleetcare in Scotland and Golden Boy’s GB Fleet Maintenance in the South. Sales are in the hands of Unvi UK in Preston and their dealers Coachtraders based near Edinburgh and Taylors Coach Sales in Cambridge. In Ireland sales are handled by Central Bus and Coach and Lir Bus and Coach Sales. 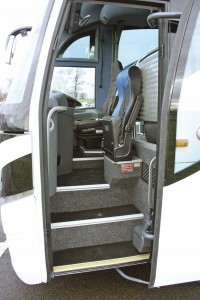 This is a lovely coach, a valuable extension to the Unvi range. It looks great and it does the job perfectly. Operators will find it useful for a wide range of duties so it should earn its keep and, based on past experience, it should also hold its price.